Fake or Fortune is a remarkable new BBC series. It explores the processes involved in authenticating artworks to determine their value as well as gain acceptance as part of a particular artist's body of work. The first episode focused on an alleged Claude Monet presently owned by retired Royal Navy Officer David Joel. The most impressive aspect of this program was the respect given to the owner and his family. This is generally unusual in the attribution game, with experts and organisations often regarding claimants with a degree of incredulity and even ridicule. This was refreshingly not the case in this episode. 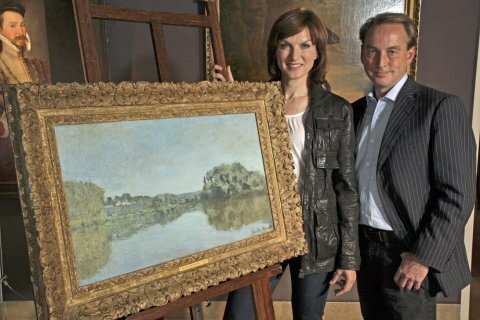 The show is presented by UK journalist Fiona Bruce and Philip Mould - author and art dealer. Mould is perhaps most recognisable as one of the experts on the British version of Antiques Roadshow. He appears prominently in various media and runs a London Gallery. One of his more intriguing discoveries was a Gainsborough painting, reported as found on eBay for 120 pounds. A special mention must also be made of Dr. Bendor Grosvenor, co-director of Mould's Gallery, whom assisted with the research into the relevant history behind the painting. Grosvenor is also the author of Art History News, a website providing updates on discoveries, sales and attribution news - primarily in Europe and regarding European artworks. It is heartening to know such programs are being created, increasing public awareness of processes that are usually privy to those in the art market or academia. Modern audiences will respond positively to the scientific analyses described in the program, such processes being akin to forensic methods that are a staple in programs about crime. What may be less tangible is an understanding of how attributions work. Indeed, this varies depending on which artist and what time period is being dealt with. In the case of Claude Monet at least, much weight is given to the Wildenstein Institute, the family publishing house responsible for a comprehensive Monet inventory, or catalogue raisonné. The authenticity of a Monet piece hence effectively depends on the assay of this organisation. Subsequent monetary values assigned to works by auction houses are dependent on this attribution being verified by its inclusion the catalogue. Below is a clip from the program, introducing the painting and its owner. As Bruce, Mould and Grosvenor explain, the key pieces of evidence sought by the Wildenstein Institute were to prove the work's existence in Monet's lifetime, as well as more accurately describe its ownership history, or provenance. Image allegedly depicts a view of Argenteuil, a town outside Paris. It is established that Monet lived in Argenteuil between 1871-1878 and painted in this region at that time, including views of the River Seine. The work is executed on canvas. The wooden support is marked with a stamp of a Paris art supplier - Latouche. Evidence presented from Monet's own account books verified he purchased supplies from this company. The style of the Latouche stamp in also in accord with the period of Monet's presence in Argenteuil. There are also inventory numbers on the support, corresponding with the known owners of this painting at different stages, going back to Egyptian collector(Mohammed Khalil) whom purchased the work from Monet dealer Georges Petit in Paris. The style of inventory numbers on the alleged Monet canvas support also corresponded to the style seen on other works purchased from the Gallery Petit. The affixed inventory stamp from Gallery Petit also establishes the work as being catalogued during Monet's lifetime. This is important from the perspective of ruling out a potential fake. Monet forgeries occurred far less during his own lifetime - gallery owners were reported to send the artist photographs to verify a presented work as original. The painting was examined by technicians in the UK and France, including the Lumiere Multi-spectral System in Paris. This technology was instrumental in providing evidence in the investigation into the purported Leonardo drawing, La Bella Principessa and will be covered in more detail in a future post. Via the ultra high fidelity (240 megapixel) images provided by the Lumiere system, analysis of technique, colour palette and the artists signature was noted as congruous with other works. This analysis was performed by Iris Schaefer of the Art Technology and Restoration team from the Walraf-Richartz Museum in Cologne, Germany. An expert in scientific analysis of Monet works, Schaefer and her colleagues famously discovered a fake among their museum's collection in 2008. To date, this was the only entry in the Wildenstein's catalogue that has been proved to be a forgery. It should be noted that the entirety of Monet's catalogue has not been subjected to the same level of technological scrutiny - hence the potential for further challenges to the Wildenstein attributions strongly exists. Professor John House of the Courtauld Institute also contributed a rich history of academic and stylistic familiarity with Monet's work. His examination of the Joel piece also concurred with that of the other (non Wildenstein) experts asked to verify the work - that the strength of the evidence, the nature of technique and subject matter all pointed to a conclusion of an authentic Monet. When sold from the Petit Gallery, and upon entering the UK(via the Arthur Tooth dealership), this painting was listed as a Monet. At some point after this (not clarified in the program) the attribution either fell from grace, or was simply not included in the Wildenstein Monet catalogue first published in 1974. Mr. Joel purchased the piece in 1992 for a sum of 40,000 pounds. 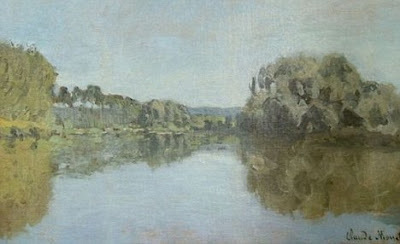 The efforts of the owner, several Monet experts and the BBC Program Fake or Fortune were not successful in overturning the Wildenstein Institution's ruling on the piece. The Wildenstein's reasons are particularly sketchy, highlighting a disregard for the evidence presented. A potential distorting factor is mentioned by the show's presenters, as reported by Professor House whom met with the Institute. This was regarding the Institution's familial basis, with the attribution being originally rejected decades ago by Daniel Wildenstein. It is hence claimed his son Guy was loathe to dishonour his father's memory by reversing the attribution. This highly emotive consideration introduces a significant bias to the integrity of the Wildenstein's rulings. It also raised speculation as to what degree of independent input its committee members actually have. For us this is a matter, not of history of ownership, but of connoisseurship... If David Joel's picture was not included in my father's book, it is because he knew of no paintings in Monet's oeuvre that were executed in the distinctive style of that riverscape... The present members of the Monet Committee came to the same conclusion. It is somewhat distressing that the very provenance research the Institute requested subsequently held little sway over their consideration. That Guy Wildenstein so openly refers to his father's assessment (shown to be incorrect in at least one case, and potentially more) also reveals much about the Institute's poor research methodology and reliance on subjective and emotive factors. Philip Mould provides a nice summation of this calamity affecting the art market and the business of attributions. He states a committee of independent, academically selected individuals is preferable to one potentially compromised by familial and institutional ties. The efficacy of the Wildenstein Institute's research processes has been demonstrated as highly subjective and grossly unprofessional, judging by the vagueness of their responses to Mr. Joel over the years. Part of the blame must also rest with the major auction houses who must allow for independent analyses to influence their listings. This notion of the market revolving around reputation and credibility comes from the 19th century, where the early connoisseurs and curators held a great deal of power. With independent analysts such as Grosvenor and Mould, and advances such as the Lumiere system, one could argue that it is up to the auction houses to lead this change and shift the focus to an approach that unifies stylistic analysis(connoisseurship) and scientific techniques. Having recently explored the attribution for Raphael's Madonna of The Pinks, one can also argue towards the dangers of any committee arrangement. In that instance, 30 specialists were complicit in attributing a Raphael work which an examination of the evidence can highlight reasonable concerns with. It is an unfortunate requirement of the art market and insurers that a definitive answer be given about authorship. In the case of Renaissance paintings produced in a workshop environment, this is increasingly difficult. This is relatively easier when considering an individual artist like Monet, whose movements are better documented. Looking ahead, Fake or Fortune will next be presenting a Winslow Homer piece found near a rubbish tip, as well as investigating a painting by Hans van Meegeren - the infamous Vermeer forger. It would be fascinating to see Fake or Fortune investigate the NGL's questionable attribution for the Madonna of The Pinks, but I feel that neither Mould or Grosvenor are sufficiently independent to the art world to hazard openly criticising the NGL. Attacking the aloof and temperamental Wildensteins is one thing, asking Nicholas Penny et al to account for the Pinks decision is another. Fascinating post, H. I guess there is no realm where personal politics doesn't influence decision-making (especially when there's lots of money involved!). Well stated Vicky. Juggling aspects of human nature and politics always complicates matters - this case is no exception. At least this program has been successful in spreading awareness of this situation. How long it will take the Wildenstein Institute or the auction houses to adjust will be the interesting part, if they adjust at all. I've been giving out Irresistably Sweet Blog Awards at Pop Classics, and gave you one! For those curious about the nature of the award, visit Juliette at Pop Classics. It's good to point out some of the politics that influence attributions and decision-making in the art world. I haven't seen "Fake or Fortune" (I'll have to try and see if it is available for viewing in the States, especially because of the upcoming episode on Van Meegeren! ), but I imagine that viewers don't get a sense of this political background. Cheers for the comments M. I'm also really looking forward to the van Meegeren episode! I'm not sure I share your optimism though! When large sums of money are involved, human nature can bring out the worst in people. This emphasises the importance of procedure, detail and verification, conducted by independent parties rather than specialists roped in by galleries, dealers and such. Great post, H. Really enjoyed it. And thanks for the clip. As we hear, Mr. Joel first heard the painting was valued at around 1/2 million, but then bought it for a mere 40,000 pounds in 1992. What could explain this drop in value? From what I can gather, the five volumes of Wildenstein were originally published in this sequence: 1974 (I), 1979 (II & III) and 1991 (IV & V). I don’t have access to these volumes, but volumes II to IV seem to be chronologically organized, while the fifth was “a supplementary volume of additional paintings as well as drawings and pastels” (Wikipedia). In other words, once volume 5 was published in 1991, it became settled once and for all that the painting was not considered by W to be a Monet, and the market value suddenly changed. Of course, by not accepting the work, Wildenstein had also made the painting affordable! As long as Mr. Joel knew that he was buying a “Monet” that had not been accepted into the canon, I don't think there's much of a problem. He realized (I hope) that his purchase was essentially a gamble on the possibility that W might eventually be disproved, lose his authority, or change his mind. This may help to explain the tango that Mr. Joel and the W Institute have been dancing over the years. And perhaps Mr. Joel is simply the latest partner: the previous owners of the work would surely have also questioned W’s refusal to accept the work as a Monet. For better or worse, the asymmetry of this situation is at least stimulating further research into the painting. Great points Ben. It is not made clear in the program how the work went from being a Monet sold by the UK dealer Arthur Tooth to something worth 40K. It is likely that its previous owners had also tried to have it verified, and its subsequent exclusion from the W catalogue in 1974 and beyond resulted in the price reduction. Mr. Joel did indicate that he was not able to purchase it when he first saw it at 500,000 hence the reasoning that the Wildenstein's decision made the painting more affordable to him is quite valid. The art market is opening up, with Western art of particular interest to rich patrons in the Middle East. This reminds me of the Pollock case, which despite not being accepted by the Krasner-Pollock crowd has still attracted a 9million dollar purchase offer from this direction. I wonder if something similar will happen with the Monet? Thanks for this, which I came to via a search after watching the program this evening here (in the U.S.) on PBS. My perspective is different from most because my father was an art dealer, and was instrumental in the "discovery" of some significant American painters. His experience was rather the inverse of what happened in the case of David Joel's Monet, where an institute founded by a dealer has overridden the judgment of established scholars: dealers' insights in my father's day were often -- indeed, somewhat routinely -- dismissed or ignored by art scholars and by major museums. Thus it was that sometime in the 1950s he once offered the Metropolitan Museum in New York a painting by Fitz Henry Lane (then known as Fitz Hugh Lane) for some $2500, an offer the museum passed over... only to buy the exact same painting a decade or so later for many times that amount, because by then Lane had been "adopted" by prominent scholars like John Wilmerding of Dartmouth (who literally "wrote the book" about Lane). So it is not always dealers whose judgment fails, or whose arrogance overrides rational assessment of a work's true value. In the case of Mr. Joel's Monet, however, the shoe is plainly on the other foot, and M. Wildenstein's bizarre, subjective dismissal of the case made on the program is IMHO an embarrassment to the universe of art dealers. My father would be appalled. And so am I. Welcome to 3PP Christopher and thank you for sharing your insights. Im imagining your father had quite a few experiences such as the one you have related. As for the Joel case, the behaviour of the Wildensteins in this matter was quite jarring. It was sad to note that Dr. John House passed away last year and will never be able to see if there will be progress on this case and others like it.